“1 Saul also sent messengers to David's house to watch him and to kill him in the morning. And Michal, David's wife, told him, saying, "If you do not save your life tonight, tomorrow you will be killed." 12 So Michal let David down through a window. And he went and fled and escaped. 13 And Michal took an image and laid it in the bed, put a cover of goats' hair for his head, and covered it with clothes. 14 So when Saul sent messengers to take David, she said, "He is sick." 15 Then Saul sent the messengers back to see David, saying, "Bring him up to me in the bed, that I may kill him." 16 And when the messengers had come in, there was the image in the bed, with a cover of goats' hair for his head. 17 Then Saul said to Michal, "Why have you deceived me like this, and sent my enemy away, so that he has escaped?" And Michal answered Saul, "He said to me, 'Let me go! Why should I kill you?'" 18 So David fled and escaped, and went to Samuel at Ramah, and told him all that Saul had done to him. And he and Samuel went and stayed in Naioth. 19 Now it was told Saul, saying, "Take note, David is at Naioth in Ramah!" 20 Then Saul sent messengers to take David. And when they saw the group of prophets prophesying, and Samuel standing as leader over them, the Spirit of God came upon the messengers of Saul, and they also prophesied. 21 And when Saul was told, he sent other messengers, and they prophesied likewise. Then Saul sent messengers again the third time, and they prophesied also. 22 Then he also went to Ramah, and came to the great well that is at Sechu. So he asked, and said, "Where are Samuel and David?" And someone said, "Indeed they are at Naioth in Ramah." 23 So he went there to Naioth in Ramah. Then the Spirit of God was upon him also, and he went on and prophesied until he came to Naioth in Ramah. 24 And he also stripped off his clothes and prophesied before Samuel in like manner, and lay down naked all that day and all that night. Therefore they say,"Is Saul also among the prophets? "” 1 Sam 19:11-24, NKJV. “My Saul must die today”. I don’t know who / what your Saul is. Michal, David’s wife told him that he had to run away or he would die. Remember that Michal was Saul’s daughter. Some of us have been given things by our mothers or fathers, which are bothering us today. Some were given witchcraft, drunkenness, idolatry, stealing, lying etc You must say “no” today and say “My Saul must die today”. That thing that you got from your father may be sin, gossip, witchcraft, lack of money (because of the satanic thieves), etc Your money must stay, it must stay in your pocket. “My Saul must die today”. Whatever is eating your money must die today. It can only stop if you find ways to stop it. Whatever is stealing, killing or destroying in your life must die. David heard that he was to die that day and he ran away. He knew that men could not help him. He ran to a man of God, Prophet Samuel. When he got to Ramah prophet Samuel was not there and so he had to go to Naioth. In Naioth there were men of God who were always consulting God and he knew they could help him. You must find your Naioth. In order to kill your Saul, you must go to your Naioth. At your Naioth there are men of God who are always consulting God and who can help you. David knew very well that the man of God would help him. When he was told that he would die, he did not panic or cry, he knew that the men of God will help him. When he found Prophet Samuel, he was with other young prophets prophesying. Prophet Samuel told David, let us go to Naioth. The message got to Saul that David was with the prophet. The same might happen to you: Those who you were sinning with, bewitching with etc, might hear that you have now changed and you are now in church, that you have now received Jesus Christ as your Lord and saviour. “My Saul must die today”. Saul must no longer bother us: you may be tormented by the spirit of witchcraft that makes you to bewitch people even when you have no chosen to do so or agreed to be a part of it. Today “Your Saul must die”. David ran to Prophet Samuel. Prophet Samuel is the one who annointed David to be king. When David was with Prophet Samuel, the message got to Saul that David is now in Naioth with Prophet Samuel. Saul was furious and sent his people to go and fetch David. When you renounce and reject the devil, he will send his messengers to come and torment you to tempt you, through affliction and pain, to go back to him. When Saul’s men were about to arrive where David was, the spirit of the Lord came upon them and they began to prophesy. When the witches and wizards come to attack us, they must be transformed by the spirit of the Lord that is upon us. The spirit that was on the men of Saul to kill was changed by the spirit of the Lord to the spirit of prophesying. We must do the same and ask the Holy Spirit, “Spirit of the Lord help me, take over” and the spirit of the Lord will take over. When Saul realised that the first troop was not coming back, he sent some more men and they ran to Naioth. When they arrived there, the spirit of the Lord fell on them and they started to prophesy also. When our enemies send non-believers to us to come and attack us or deceive us, they will go back transformed. Tell the Holy Spirit, take over, and take charge. When Saul realised that the 2nd troop was also not coming back, he sent the 3rd troop. They ran because the king had ordered them and when they ran to Naioth, the same happened to them and they started prophesying. After this, King Saul did not know what to do and he said “Let me go there myself”. He said “I will go there myself and kill him, I will tear him into pieces myself”. He went in his kingly apparel. Before King Saul reached the well that is at Sechu the spirit of the Lord came heavily upon him. With the troops it was better as they were able to get near to where the man of God was but with King Saul the spirit of the Lord hit him when he was still afar. He took of his kingly clothes and started to prophesy day and night. The spirit of the Lord will make your enemies to prophesy. King Saul was not prophesying with David. People knew King Saul as a killer and one who consults mediums and they were surprised to see him prophesying. “Why is King Saul prophesying?” they asked. We must say today “My Saul must die today. I don’t want you anymore. You are no longer going to live within me.” The spirit of the Lord is saying there are many out there, and they have to come to the church and meet the man Jesus Christ so they can also receive their salvation. The church needs prophets. When the outside world sees the good things, the blessings and the love of God upon us they will come and realise that what they have believed in so far has been nothing. That they have believed in a lie and that only Jesus Christ is the true Lord and saviour. Satan has never created anybody and all people must worship the Lord, the living God. Instead of me dying “My Saul must die today”. The prophetic spirit killed the murdering spirit that was in the troops and in King Saul. “My Saul must die today” in the day of Elijah the fire of the Lord came down and consumed the water. We know that water can consume fire but on that day they saw the fire of the Lord consume the water. Our God is a consuming fire. We must be united like the young prophets who were with Prophet Samuel and be one and the fire of God in the church will continue to burn and defeat the enemy. This fire of God transformed King Saul. We must call the spirit of the Lord to help and to enhance our gifts so that we can use those gifts in the house of the Lord. If one person has been given one gift let us intercede for that person so that his or her can gift can excel. Pray and ask God to kill all the Saul/s in you, in your life. 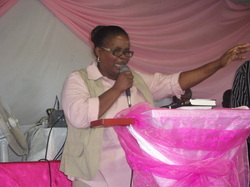 “Shaking the foundations of your prisons” by Mr Mboneni Rathiyaya at Tshikota PHC, Sunday Service, the 11th of March 2012. 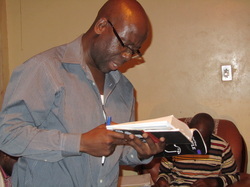 Mr Mboneni Rathiyaya (old photo). Scripture reading: Acts 16:16-20, 30 and 31. “16 Now it happened, as we went to prayer, that a certain slave girl possessed with a spirit of divination met us, who brought her masters much profit by fortune-telling. 17 This girl followed Paul and us, and cried out, saying, "These men are the servants of the Most High God, who proclaim to us the way of salvation." 18 And this she did for many days. But Paul, greatly annoyed, turned and said to the spirit, "I command you in the name of Jesus Christ to come out of her." And he came out that very hour. 19 But when her masters saw that their hope of profit was gone, they seized Paul and Silas and dragged them into the marketplace to the authorities. 20 And they brought them to the magistrates, and said, "These men, being Jews, exceedingly trouble our city;” Acts 16:16-20, NKJV. “30 And he brought them out and said,"Sirs, what must I do to be saved?" 31 So they said,"Believe on the Lord Jesus Christ, and you will be saved, you and your household." Acts 16:30-31, NKJV. In this book we read about the arrest and torture of Paul and Silas, their transgression being that Paul cast out a spirit of divination from a young woman. It appears there were people that were making money out of this young woman’s misery. The bible tells us that her masters were very furious with what Paul had done, so they ordered that they be arrested. Paul and Silas were beaten and locked up and the jailer was threatened with death should these men of God escape. In the middle of the night, regardless of the pain that Paul and Silas were in, they stood up, worshipped and praised the Lord. In the midst of darkness, without any promise of light, they stood up. In the midst of all pains that they suffered from the beating, they stood up. Despite being put in the inner (maximum) prison, which in South Africa you may compare to C-Max, it didn’t deter them from praising God. Maybe you’ve been told how worthless you are by people close to you, worship and praise the Lord in that situation. The bible says Paul and Silas worshiped the Lord until the foundations of the prison were shaken and prison doors opened. The people that are needed are those who can praise and worship the Lord until the foundations of their prisons are shaken. When the foundations of your prisons are shaken, everything becomes loose. The structure of your prison gets out of shape, the frames bends and the doors of your prisons open up. My friend, I don’t know what is imprisoning you. You know in what prison you are. In the middle of the night, God is waiting for you to praise Him, to worship him. Forget about your problems and worship the Lord and you shall see the salvation of the Lord on your behalf, so says Moses to the children of Israel. The bible says “17 You will not need to fight in this battle. Position yourselves, stand still and see the salvation of the Lord, who is with you, O Judah and Jerusalem!’ Do not fear or be dismayed; tomorrow go out against them, for the Lord is with you." 2 Chron 20:17, NKJV. Glory to be to the Most High God, the creator of Heaven and earth and all that lives.